I am kinda excited to share with you brisk reviews of books consumed during 1st month of 2011; January’s portion contained-> classics by Robert Pirsig: Zen and the Art of Motorcycle Maintenance; Heath’s brothers brought in great insights on managing change in their book Switch; Guys from 37 signals wrote brilliantly bold and easy to read (harder to execute though) book Rework & I have concluded month with Freedom from Known by Jiddu Krishnamurti. So, let’s dig into 4 pieces, which kept me awake during nights, aware during days & inspired me to act, change & re-learn. Switch: How to Change Things When Change Is Hard was well spent money & time. Firstly I have heard praise for it by Seth Godin & then our friend & SCG-er, J.D. Meier was inspired by Switch in April last year, when he has shipped a blog post with title The Elephant and the Rider. (you can see my comment bellow stating that I should read it, I did now, yay!) Thanks for it J.D., so I will not be repeating lessons learned from this must read book again. Rework is brilliant, brisk read with great cartoons & design inside the book. You could feel heart beats of authors – true doers Jason & David invading & shaking your brain, page after page. I did not put this book down till I have finished it. (those poor coffee shop guys must have been worried about me, witnessing me to sit without a move for 4 hours). Get it! Read it! For more inspiration check out quotes column bellow and this super cool TED talk by Jason – Why work does not happen at work. Oh, my what a book. One would say, that you can finish this tiny barely 100 pages long book during one afternoon session. Mistake! “Don’t judge book by the cover” totally applies for: Freedom from Known by J. Krishamurti -> one of the greatest minds of the last century. You can consume this book only in very small portions. I must confess that sometimes I was not able to digest one full page; I had to pause & reflect on those lines full of wisdom and I am still reading it, even tough it is already end of February…Thank you Jiddu. So, if you are equipped with patience and courage to face your own self, read it. The real world isn’t place, it’s an excuse. It’s justification for not trying. Evolution does not linger on past failures, it is always building upon what worked. You need a commitment strategy not an exit strategy. When you get in that flow of making decision after decision, you build momentum & boost morale. Decisions are progress. People use equipment as a crutch, they are looking for shortcut, but you just don’t need the best gear in the world to be good. Competition can never copy the you in your product. Do less than your competitors to beat them. It’s better to go down fighting for what you believe in, instead of just imitating others. Teach & you will form a bond, you don’t get from traditional marketing tactics. Marketing is something everyone in your company is doing 24/7/365. Never hire anyone to do a job until you’ve tried to do it yourself. Remember that negative reactions are almost always louder & more passionate than positive ones. You don’t create culture. It happens. Culture is action not words. Policies are collective punishment for misdeeds of an individual. Don’t create them! what was on your reading menu in January 2011? Have you read of any above books? Share with us your recent reading excitement, too. May me some of these ideas can be implemented in your Leadership Project. And thanks for sharing precious links for Krishnamurti’s work. See you around again, Domino Project buddy! Thanks for sharing your reading list Tomas! 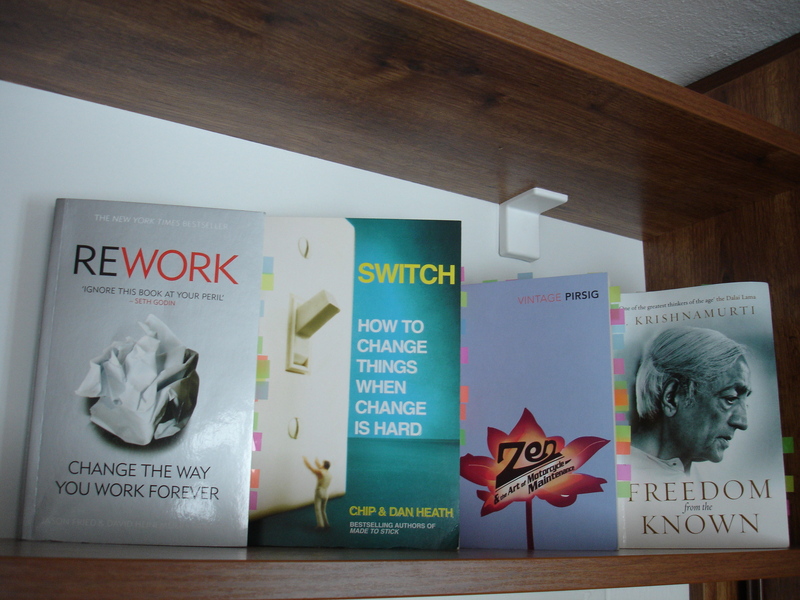 4 books is the best I can do as I am not reading books, I am studying them, highlighting, making notes and the most importantly-> applying what I have read in real life -> that is a reason why do I manage to read only 4 books a month. So, my answer for HOW do I manage, is that is not about how, but WHY?